David Obringer is the special collections librarian and university archivist at Edinboro University, with occasional stints teaching in the history department. The strike date is October 19. It has been 430 days without a contract (as of 10/12/16). 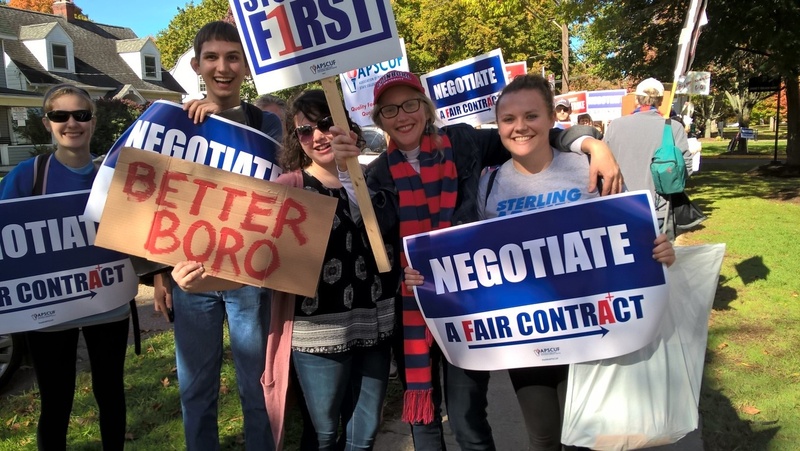 Some negotiations will take place beginning October 14 but considering the offers presented thus far and the space separating bargaining positions, it is just too daunting to be optimistic. Among other things, the Association of Pennsylvania State College and University Faculties (APSCUF), is fighting against a 20% reduction in pay for temporary faculty. These are faculty the State System negotiators refer to as “teaching machines.” At the same time, they want to increase their workload beyond what tenured and tenure track faculty have. Essentially this establishes two unequal branches of faculty. This is among the numerous offensive cuts and concessions being offered. You can add your voice of support by emailing [email protected]. You can offer your criticism by writing to the Chancellor’s blog. Temporary and contingent faculty are a target for cost cutting. This is a national trend and APSCUF is fighting hard to halt it. Find the latest news at APSCUF.org. up and spirits rose as the pipers made their way across campus. band came over to play the school fight song. only improved and the faculty are grateful for their efforts.